Advance registration is open through May 30, 2019. Once again, we will award two Best in Show trophies for Vintage Stock and Vintage Custom bikes as well as 8 trophies based on judges choice for “Outstanding” bikes in the show. Register early – It’s cheaper and spots are limited. Last year we sold out! Entry fee: $15/bike in advance (must register online noon on by May 30, 2019) or $25/bike on-site the day of the Rumble. All entrants will receive some Brewtown Rumble swag and bikes selected by our judges will receive a one-of-a-kind handmade trophy made by local riders and artists. Participating motorcycles must have three wheels or less and run on their own power. Show bikes MUST arrive between 9-10:30 am and remain parked in the show area until the awards are announced at 3:30 pm. Enter the show on 6th and Bruce St. This is the ONLY way you can enter. There will be “bike show” signs and volunteers to help direct you. Stop at the bike show reg table to check-in. You will get a tag for your bike and a Brewtown Rumble patch along with some other swag. 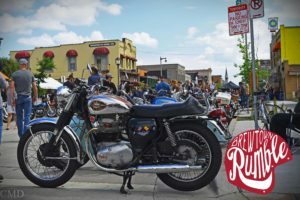 All bikes in the show will be parked on the block in front of the Fuel Café (630 S. 5th St.). Judging will be from 11:30 am to 1 pm. Head to the stage at 3:15 pm for the awards presentation. If your name is called, join us on stage to receive your award and get your picture taken. Please wait near the stage until the awards are finished for a group photo. All Proceeds from the Rumble support the BUILD Moto Mentor Program.